Pictured here is sophomore midfielder Emily Duffey. Through five games, Duffey has the fourth-most points on the team (7) and the best shot on goal percentage (.917). Coming off a tough loss to No. 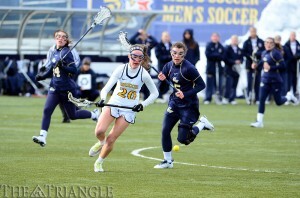 15 State University of New York at Stony Brook last week, the Drexel women’s lacrosse team was looking to get back on track against Colgate University March 1 in its first road game of the season. Unfortunately for the Dragons, their road opener did not end in celebration. Drexel looked strong in the early going as the Dragons were able to jump out to a 2-0 lead to start the match, both goals courtesy of sophomore midfielder Emily Duffey. The lead was short-lived for the Dragons, however, as Colgate’s Monica White scored twice in a two-minute span to even up the score. Lead changes were abundant in the first half as the two teams battled back and forth. Junior midfielder Joelle Hartke scored for the Dragons to regain the lead with 20:35 remaining, but the Red Raiders’ Megan Ark followed with one of her own just over a minute later. The tie, once again, did not last long as Hartke put in her second of the game just 69 seconds after Ark scored. Following Hartke’s second goal, Colgate began to seize control of the game. White and Ark scored in succession to grab the lead for the Red Raiders with 16:41 to play in the half. Hartke added her third goal with 9:10 left, but Kallan Murray and Ark would follow to give Colgate a two-goal advantage. Hartke scored an unassisted goal before the period ended to leave Drexel down by only one. The second half did not begin well for the Dragons as Colgate added to its lead with a 5-2 run in the opening 15 minutes. Senior attacker Kelly Palace and Duffey scored the two goals for the Dragons. Facing a four-goal deficit with under 12 minutes to play, junior attacker Alissa Watts was able to get one back for the Dragons and put them within striking distance. The Red Raiders once again answered the Dragons goal, however, as Ark scored her sixth of the game to put her team up 13-9. Watts added another goal with 6:37 left in the game, but the Dragons were held scoreless after that as Colgate secured a 13-10 victory. Even though the Dragons were unable to pick up the victory, there were still some positives to take out of the game. Joelle Hartke had her first four-goal game of the season and now has 11 points on the season, which is tied for the most on the team alongside senior midfielder Amanda Norcini. Rudloff is pleased with the team’s development so far and believes the talent and diversity on the team will prove big over the course of the season. “What’s nice about this team is that in every game so far, someone different has stepped up and had a great game,” she said. “I think that’s all part of the building process with this young group, learning who you can depend on to make a play, and we need to consistently have more people playing confident, aggressive lacrosse every game. In an attempt to stop their first losing streak of the season, the Dragons traveled to Villanova University March 5. Drexel’s effort was thwarted, however, by a hungrier Wildcats team. The Dragons fell into a deep hole to start the game as the Wildcats jumped to a 5-0 lead. Norcini scored the Dragons’ first goal off a free position shot just before halftime, but the momentum could not be sustained heading into the second half. In the first eight minutes of the second half, Villanova added two more goals to take a six-goal lead. With 18:45 remaining, Palace gave the Dragons their second marker of the game. The Wildcats would add one more goal to make it 8-2 before the Dragons made a strong push at a comeback. Sophomore midfielder Milan White started the Dragons push with a free position goal with 7:52 left. A brief 23 seconds later, freshman midfielder Caroline Thiele tallied her third of the season to cut the Wildcats lead to four. With 3:15 remaining, Palace gave Drexel hope with a free position goal, her 10th of the season. Despite Drexel’s late efforts, the Dragons could not complete the comeback and fell to Villanova by a final score of 9-5. The Dragons will look to rebound off their recent losing streak when they come back home to host University of Maryland, Baltimore County March 8.